SKU: 6812087 Categories: Anatomicals Face Masks & Face Cloths, Face Care, The Fashionista Mama. 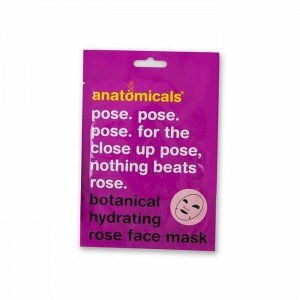 Tags: €5 & under, botanical, extract, face mask, fask, hydrating, pose, rose. Come into the Garden, Maud. it’s mother nature’s beauty parlour. let our hydrating mask with balancing rose flower extract leave your skin flawless and radiant, with not a hint of dryness, flakiness, green fly or mildew. close up, we’ll turn you into a pruning (shouldn’t that be preening?) picture of perfection. Open pouch, take out per-nourishment mask and unfold. Press lightly with fingertips to set the mask in place over your cleansed face. Relax for 20 minutes and remove mask. Gently massage remaining fluid into the skin. Do not apply to irritated or sensitive skin. If skin irritation occurs, discontinue use and rinse thoroughly with cool water. For external facial use only. Avoid contact with eyes. If essence gets into your eyes, rinse thoroughly with water. Keep out of reach of children. Store in a cool dry place. Aqua, glycerin, betaine, panthenol, ammonium acryloyldimethyltaurate/vp copolymer, phenoxyethanol, peg-16 macademia glycerides, allantoin, butylene glycol, ethylhexylglcerin, sodium hyaluronate, hedera helix (IVY) extract, rose centifolia flower extract, aloe barbadensis leaf extract, maltodextrin, methylisonthiazolinone.